REBECCA HARRIS has the best odds of any Castle Point general election candidate – making her more favoured to win the seat than any other candidate. With odds of 16/5 from website Betfair, Dr Spink has been judged as likely as the BNP candidate to win. Betfair puts the Conservatives on 30/100; the Lib Dem candidate on 21/1 and Labour at 39/1. UKIP’s chances are rated at 59/1. THIS YEAR, Bob Spink will be standing (as his nomination form shows) as the Prospective Parliamentary Candidate for the Independent Save Our Green Belt Party – whose manifesto for government (or even local politics for that matter) has yet to be published. At last, Spink has revealed his intention to attempt a political coup of the mainland – and also position himself for becoming Castle Point’s first elected mayor. As first revealed on this blog, and now further confirmed by Dave Blackwell’s support for Spink on the latter’s nomination form, the two leaders are intent on carving-up the borough between themselves. Their purpose? To ensure lucrative government posts for themselves from which they cannot be easily deposed. Do not expect to hear much of the issues facing the country, or this borough, from either of the independence parties. And do not expect to see much coverage of this campaign’s real issues in the local press. The Echo has already indicated its intention to pursue ‘its’ Save Our Pool Campaign as a means of bolstering both camps’ support (despite the Borough and Town councils being in private talks) – and we can probably be sure that, in the coming weeks, Bob’s picture will again be adorning their pages. However, how that paper will be able to justify so much Spink coverage, now that he has adopted the clothes of an unknown political force, remains to be seen. There are strict rules governing the amount of press coverage that can be devoted to individual parties in an election campaign – and Spink may have cut his own political throat. Had he maintained his independent status, he could have pointed to his support as a Conservative candidate and argued the case for the largest slice of the political coverage pie; but, under his new circumstances, candidates for the Official Monster Raving Loony Party would be entitled to more. (And they at least have a manifesto for government). Spink was quoted as saying: ‘This is very relevant nationally and locally. Bob is vehemently opposed to nasty rainwater being allowed to find its natural course through the island’s drainage system – or being evaporated by the sun. To hear him speak one would believe that islanders are forced to wade through several inches of water each day while going about their normal business – a fallacy that is often portrayed in photographs taken immediately after a seasonal downpour. Max was setting the stage for Spink, once again, to blame others for his future defeat. But the fact is that Bob’s bill was totally ill-conceived from the outset. Hastily constructed in order to fuel the bandwagon presented by the Environment Agency advising ‘against any new building on the island because of the risk of surface water flooding,’ Bob saw an opportunity to thwart the Borough Council’s planning ability by passing a law to ensure that the Environment Agency (a totally unelected and unaccountable quango) could veto all local, democratically elected, decision makers. But Bob has no thought for Democracy. 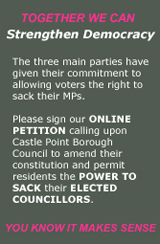 Time after time he has shown that his only agenda is to attack and hamper local government in Castle Point – and the Echo has chosen to join him in his quest: because a juicy local protest can help increase a flagging circulation base. Fortunately, parliament can still distinguish a bill that is designed to undermine the very foundations upon which that honourable establishment is based. Bob’s bill failed to obtain a second reading and has therefore been dropped. Can We Have A Free Local Press For The General Election? LAST WEEK I was ‘doing a Julian,’ musing on the possibility that the onset of Spring had been accompanied by a general reluctance by the Echo to publish Spink’s questionable newsletters. But, just two days later, the ‘newspaper’ went to press with another bandwagon piece regarding eight island children being refused places at their secondary school of choice. Instead of accompanying their friends to Castle View school, the poor youngsters will have to endure the hardship of trekking all the way to Cornelius Vermuyden instead. Characteristically, Bob Spink, our local MP, vented his anger at the Tory led Essex County Council for marking Furtherwick Park school for closure. 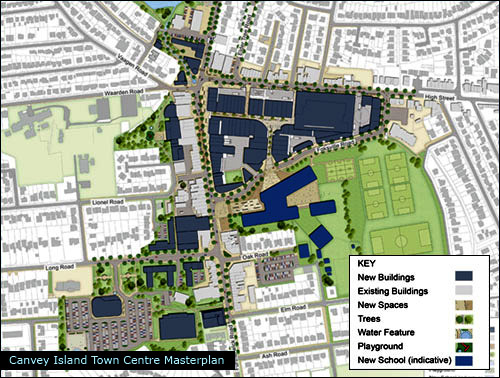 ‘Canvey has yet again been betrayed by the council,’ the Echo quoted Spink as saying. It seems that even the onset of Spring has no effect on Bob. The next day, Spink actually made it into the Nationals; although not in the way he had intended. Fran Abrams, at the Guardian, wrote an insight piece on children with behavioural problems and chose Bob Hall and Canvey’s Continuum School to illustrate what can be achieved by dedicated people – and the opposition that such schools face from hard-line nimbys and bigots. She chose Spink to represent the latter. As if at their master’s command, the Echo decided to re-visit their Continuum School coverage on Thursday. The piece was devoid of any news; but obviously written to gauge public opinion for Bob’s campaign in the wake of the Guardian’s feature. Despite obtaining resident opinion that concurred with Fran’s article, Sarah Calkin wrote determinedly about the school remaining as some form of community threat to measure those negative attitudes that the Echo had so carefully fostered last year. But her readers remained silent. The only feedback she obtained was from ‘upset, Canvey’ bringing readers’ attention to the fact that, despite all Bob’s bluster, he had achieved nothing. Spink must have been very disappointed. Paul Offord, at the Echo, chose midday on Friday to report Wednesday evening’s residents’ meeting regarding Canvey’s Concord pool. 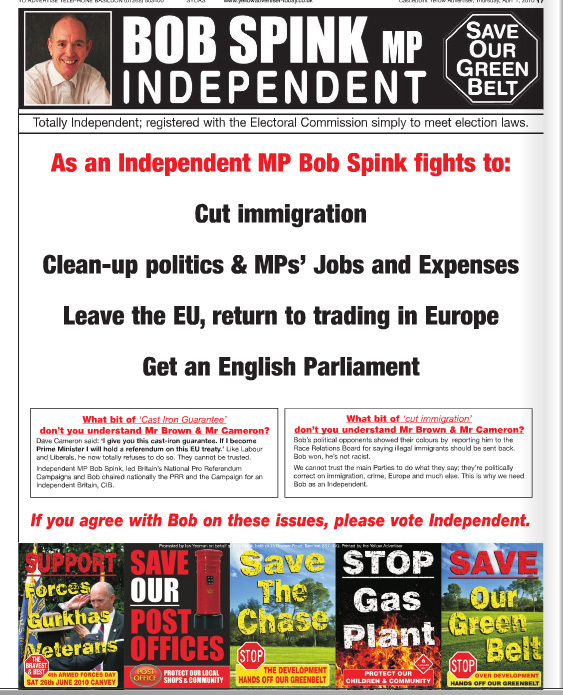 Spink was not mentioned, of course, since Bob has distanced himself from this particular campaign and handed it over to the Echo. Bob does not want to be seen as leader of this protest so close to a general election (when he might be criticised for stoking-up public anger for political ends). Moreover, should the protest fail, he does not want to be personally associated with its downfall. 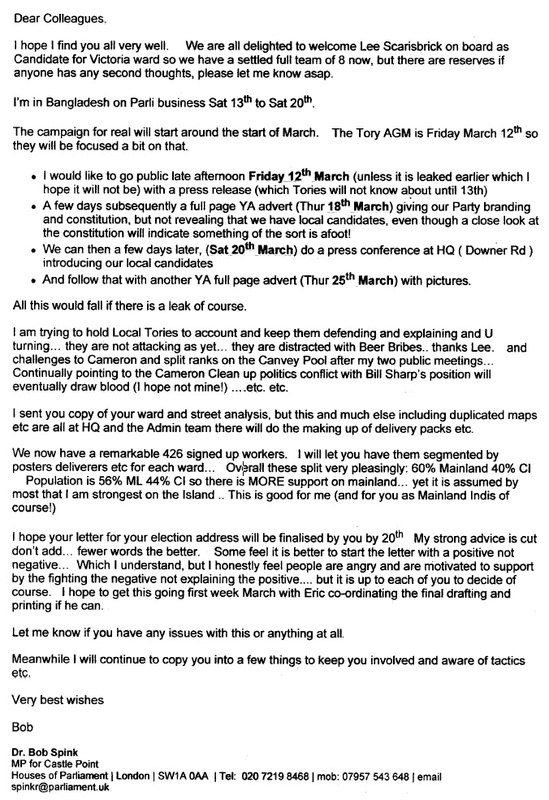 Why Paul should wait so long to file his report is perhaps explained by this blog’s coverage of Spink’s campaign letter,on Wednesday. Quickly placing it into the public domain forced Spink to bring forward his plans and cut-short public speculation. Early Friday morning, the Echo was forced to announce that Bob was setting-up a new national political organisation: the Independent Save Our Greenbelt party. This was a scoop for the Echo (as you would expect for anything to do with Bob); but the strange thing is that they, and the Yellow Advertiser, had both been given Bob’s letter hinting at the fact long before I had received a copy. Neither chose to publish it – or even mention its existence (despite the fact that this was its source’s avowed intention). So, once again, it falls to a small local blog to reveal the truth about Spink. This time regarding his relationship with the Canvey Island Independent Party. Neither the Echo, nor it seems, the Yellow Advertiser, deem such information to be in the public interest. A free local press for the general election?.. Filed under: Editorial | Tagged: Bob Spink, The Echo, The Guardian, The Yellow Advertiser |	Comments Off on Can We Have A Free Local Press For The General Election?